First Listen: Bear In Heaven, 'I Love You, It's Cool' Bear in Heaven's songs are sweet, simple and charmingly buzzy, with each whirring synth wrapped around a core of pure pop. Bear In Heaven's new album, I Love You, It's Cool, comes out April 3. It's natural to maintain a bit of skeptical distance from a band with a gift for gimmickry; to assume that clever publicity stunts are there to mask deficiencies in the music. 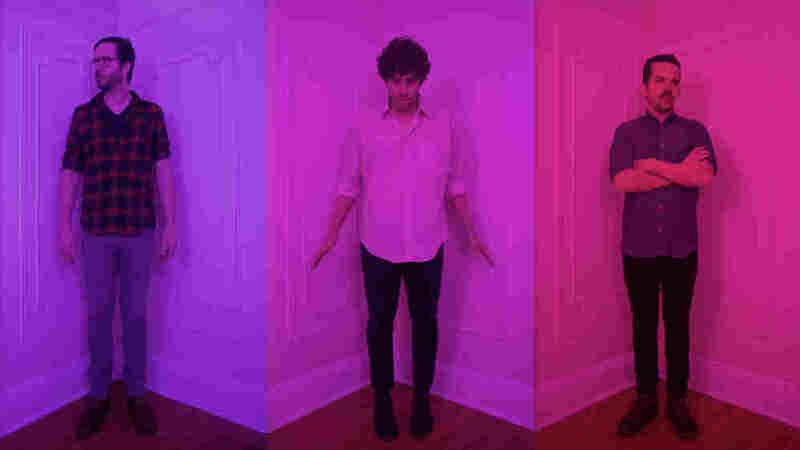 Way in advance of I Love You, It's Cool's release, the Brooklyn trio Bear in Heaven stretched and slowed the album to a glacial crawl spanning 2,700 hours, and streamed the resulting drone online as an early opportunity to hear the record in its entirety. Between that and a gift for mockumentary, it's reasonable to expect a bit of jokey novelty in Bear in Heaven's music. But listen to I Love You, It's Cool — preferably the 44-minute version due out April 3 — and there's no winking whatsoever. For all of Bear in Heaven's tongue-in-cheek marketing savvy, its songs are sweet, reasonably simple and charmingly buzzy, with each whirring synth wrapped around a core of pure pop. Like Active Child without the harps, Bear in Heaven infuses I Love You, It's Cool with textured electronics and choirboy vocals, but these songs aren't so ethereal, opting instead to swoon and shine on the dance floor. I Love You, It's Cool does get a bit samey after a while: Members Adam Wills, Joe Stickney and Jon Philpot tend to focus most of their creative energy on a singleminded charm offensive, built around rich washes of synths and a tone of pop-friendly approachability. But when a one-track mind leads to a destination this appealing, what's the use in complaining?